"Fear of 13" redirects here. For the film, see The Fear of 13. Stall numbers at Santa Anita Park progress from 12 to 12A to 14. Triskaidekaphobia (/ˌtrɪskaɪˌdɛkəˈfoʊbiə/ TRIS-kye-DEK-ə-FOH-bee-ə, /ˌtrɪskə-/ TRIS-kə-; from Greek triskaideka, meaning 'thirteen', and phobos, meaning 'fear') is fear or avoidance of the number 13. It is also a reason for the fear of Friday the 13th, called paraskevidekatriaphobia (from Greek Παρασκευή (Paraskevi), meaning 'Friday') or friggatriskaidekaphobia (after Frigg, the Norse goddess after whom Friday is named in English). The term was used as early as in 1910 by Isador Coriat in Abnormal Psychology. From the 1890s, a number of English language sources relate the "unlucky" thirteen to an idea that at the Last Supper, Judas, the disciple who betrayed Jesus, was the 13th to sit at the table. The Bible says nothing about the order in which the Apostles sat, but there were thirteen people at the table. If the seller have gone to (his) fate (i. e., have died), the purchaser shall recover damages in said case fivefold from the estate of the seller. Other translations of the Code of Hammurabi, for example the translation by Robert Francis Harper, include the 13th article. The exposed lift shaft of an apartment block under construction. The lift shaft has numbers marking the levels, but the 13th level is instead marked with a heart. Apollo 13 was launched on April 11, 1970 at 13:13:00 CST and suffered an oxygen tank explosion on April 13 at 21:07:53 CST. It returned safely to Earth on April 17. On Friday, October 13, 1307, the arrest of the Knights Templar was ordered by Philip IV of France. While the number 13 was considered unlucky, Friday the 13th was not considered unlucky at the time. The incorrect idea that their arrest was related to the phobias surrounding Friday the 13th was invented early in the 21st century and popularized by the novel The Da Vinci Code. In 1881 an influential group of New Yorkers, led by US Civil War veteran Captain William Fowler, came together to put an end to this and other superstitions. They formed a dinner cabaret club, which they called the Thirteen Club. At the first meeting, on January 13, 1881, at 8:13 p.m., thirteen people sat down to dine in Room 13 of the venue. The guests walked under a ladder to enter the room and were seated among piles of spilled salt. Many "Thirteen Clubs" sprang up all over North America over the next 45 years. Their activities were regularly reported in leading newspapers, and their numbers included five future US presidents, from Chester A. Arthur to Theodore Roosevelt. Thirteen Clubs had various imitators, but they all gradually faded due to a lack of interest. An elevator in a residential apartment building in Shanghai. Floor numbers 4, 13 and 14 are missing, and there is a button for the "negative first floor". Number 4 (Tetraphobia). 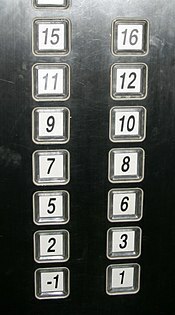 In China, Taiwan, Singapore, Japan, Korea and Vietnam, as well as in some other East Asian and South East Asian countries, it is not uncommon for buildings (including offices, apartments, hotels) to omit floors with numbers that include the digit 4, and Finnish mobile phone manufacturer Nokia's 1xxx-9xxx series of mobile phones does not include any model numbers beginning with a 4 (except Series 40, Nokia 3410 and Nokia 4.2). This originates from Classical Chinese, in which the pronunciation of the word for "four" (四, sì in Mandarin) is very similar to that of the word for "death" (死, sǐ in Mandarin), and remains so in the other countries' Sino-Xenic vocabulary (Korean sa for both; Japanese shi for both; Vietnamese tứ "four" vs. tử "death"). Friday the 13th (Paraskevidekatriaphobia or Friggatriskaidekaphobia) is considered to be a day of bad luck in a number of western cultures. In Greece and some areas of Spain and Latin America, Tuesday the 13th is similarly considered unlucky. Number 17 (Heptadekaphobia). In Italy, perhaps because in Roman numerals 17 is written XVII, which can be rearranged to VIXI, which in Latin means "I have lived" but can be a euphemism for "I am dead." In Italy, some planes have no row 17 and some hotels have no room 17. Number 39 (Triakontenneaphobia). There is a belief in some parts of Afghanistan that the number 39 (thrice thirteen) is cursed or a badge of shame. Number 616 (Hexakosioihekkaidekaphobia) or 666 (Hexakosioihexekontahexaphobia). In some regions 13 is considered a lucky number. For example, 13 is lucky in Italy except in some contexts, such as sitting at the dinner table. In Cantonese-speaking areas, including Hong Kong and Macau, the number 13 is considered lucky because it sounds similar to the Cantonese words meaning "sure to live" (as opposed to the unlucky number 14 which in Cantonese sounds like the words meaning "sure to die"). Colgate University was started by 13 men with $13 and 13 prayers, so 13 is considered a lucky number. Friday the 13th is the luckiest day at Colgate. A number of sportspeople are known for wearing the number 13 jersey and performing successfully. On November 23, 2003, the Miami Dolphins retired the number 13 for Dan Marino, who played for the Dolphins from 1983-1999. In 1966, Portugal achieved their best-ever result at the World Cup final tournaments by finishing third, thanks to a Mozambican-born striker, Eusebio, who has scored nine goals at World Cup — four of them in a 5-3 quarterfinal win over North Korea — and won the Golden Boot award as the tournament's top scorer while wearing the number 13. In the 1954 and 1974 World Cup finals, Germany's Max Morlock and Gerd Müller, respectively, played and scored in the final, wearing the number 13. More recently, other top footballers are playing successfully despite wearing #13, including Michael Ballack, Alessandro Nesta, Rafinha, Thomas Müller and others. Among other sportspeople who have chosen 13 as squad number, are the Venezuelans Dave Concepción, Omar Vizquel, Oswaldo Guillén and Pastor Maldonado. Alternate mission patch of STS-41C, with a 13 and a black cat, as it landed on April 13th, which was a Friday the 13th and this was the mission originally scheduled as STS-13. STS-41-G was the name of the thirteenth Space Shuttle flight. However, originally STS-41-C was the mission originally numbered STS-13 STS-41-C was the eleventh orbital flight of the space shuttle program. The numbering system of the Space Shuttle was changed to a new one after STS-9. The new naming scheme started with STS-41B, the previous mission was STS-9, and the thirteenth mission (what would have been STS-13) would be STS-41C. The new scheme had first number stand for the U.S. fiscal year, the next number was a launch site (1 or 2), and the next was the number of the mission numbered with a letter for that period. 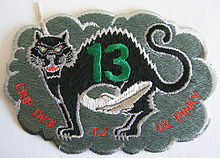 In the case of the actual 13th flight, the crew was apparently not superstitious and made a humorous mission patch that had a black cat on it. Also, that mission re-entered and landed on Friday the 13th which one crew described as being "pretty cool". Because of the way the designations and launch manifest work, the mission numbered STS-13 might not have actually been the 13th to launch as was common throughout the shuttle program; indeed it turned out to be the eleventh. One of the reasons for this was when a launch had to be scrubbed, which delayed its mission. NASA said in a 2016 news article it was due to a much higher frequency of planned launches (pre-Challenger disaster). As it was, the Shuttle program did have a disaster on its one-hundred and thirteenth mission going by date of launch, which was STS-107. The actual mission STS-113 was successful, and had actually launched earlier due to the nature of the launch manifest. At first glance, it may seem surprising that an agency whose focus lies in science and technology should devote such an emphasis to an ancient superstition.. but for one thing: the unlucky voyage of Apollo 13. ^1 The main reason for this was stated to be to increase the number of car sales in the second half of the year. Even though 70% of new cars are bought during the first four months of the year, some consumers believe that the calendar year of registration does not accurately reflect the real age of a new car, since cars bought in January will most likely have been manufactured the previous year, while those bought later in the year will be actually made in the same year. ^2 Tuesday is generally unlucky in Greece for the fall of Byzantium Tues 29th May 1453. In Spanish-speaking countries, there is a proverb: En martes no te cases, ni te embarques 'On Tuesday, do not get married or set sail'. The 13th card in Tarot's major arcana is Death. ^ "triskaidekaphobia - Origin and meaning of triskaidekaphobia by Online Etymology Dictionary". Etymonline.com. Retrieved 5 November 2017. ^ "Abnormal Psychology" p. 319, published in 1910, Moffat, Yard and company (New York). Library of Congress Control No. 10011167. ^ Cecil Adams (1992-11-06). "Why is the number 13 considered unlucky?". The Straight Dope. Retrieved 2011-05-13. ^ Harper, Robert Francis (5 November 2017). "The Code of Hammurabi, King of Babylon: About 2250 B.C. : Autographed Text, Transliteration, Translation, Glossary Index of Subjects, Lists of Proper Names, Signs, Numuerals ..." The Lawbook Exchange, Ltd. Retrieved 5 November 2017 – via Google Books. ^ "The Code of Hammurabi". Oll.libertyfund.org. Retrieved 5 November 2017. ^ "13 Things That Saved Apollo 13, Part 9: Position of the Tanks - Universe Today". Universetoday.com. 21 April 2010. Retrieved 5 November 2017. ^ "WHAT REALLY HAPPENED TO APOLLO 13 HOME PAGE". Spaceacts.com. Retrieved 5 November 2017. ^ Robinson, John J. (1990). Born in Blood: The Lost Secrets of Freemasonry. ISBN 978-0-87131-602-8. ^ "2013 Number Plates To Be Changed To Avoid 'Unlucky 13'". Irish Independent. ^ Harris, Nick (15 November 2007). "Bad Omen for Italy as Their Unlucky Number Comes Up". The Independent. London. ^ Jon Boone. "The curse of number 39 and the steps Afghans take to avoid it". The Guardian. Retrieved 28 December 2017. ^ "Aggiungi un posto a tavola, siamo in 13!" (in Italian). Retrieved 31 March 2012. ^ Colgate University. "Lucky 13". Retrieved 20 February 2015. ^ Dpa (1 July 2010). "Unlucky 13, unless your name is Mueller". Thehindu.com. Retrieved 5 November 2017. ^ "Football Facts: Who Wears Number 13?". Thefootballnation.co.uk. Retrieved 5 November 2017. ^ Almeida, Andres (5 December 2016). "Behind the Space Shuttle Mission Numbering System". Nasa.gov. Retrieved 5 November 2017. ^ Ben Evans (2007). Space Shuttle Challenger: Ten Journeys into the Unknown. Google Books. Retrieved May 30, 2012. ^ "41-G -- Challenger mission No. 6 (13th shuttle program mission overall)". Orlando Sentinel. Retrieved 5 November 2017. ^ "James D. A. van Hoften" (PDF). NASA Johnson Space Center Oral History Project. December 5, 2007. Retrieved July 20, 2013. ^ "Terry J. Hart" (PDF). NASA Johnson Space Center Oral History Project. April 10, 2003. Retrieved July 20, 2013. ^ a b "STS-41-C Information". Astonautix. Retrieved 28 December 2017. ^ a b c d e f Almeida, Andres (2016-12-05). "Behind the Space Shuttle Mission Numbering System". NASA. Retrieved 2017-01-17. ^ Evans, Ben (2012-06-01). Tragedy and Triumph in Orbit: The Eighties and Early Nineties. Springer Science & Business Media. ISBN 9781461434306. ^ "The Columbia Disaster". SpaceSafetyMagazine. Retrieved 28 December 2017. ^ KSC, Lynda Warnock:. "NASA STS-113". Nasa.gov. Retrieved 2017-01-17. ^ "Fear of 13 and Other Superstitions Embedded in Compositions". WQXR-FM. May 13, 2016. Retrieved 2019-01-24. ^ Perry, Warren. "Fears of the Fearless FDR: A President's Superstitions for Friday the 13th". Smithsonian Institution. Retrieved 2019-01-24. ^ Haberman, Clyde (May 17, 2010). "A Reading to Recall the Father of Tevye". The New York Times. Retrieved 2019-01-24. ^ Chan, Melissa. "Why Friday the 13th Is a Real Nightmare for Some People". Retrieved 8 December 2018. ^ Tobias, Scott (March 29, 2016). "Film Review: 'The Fear of 13'". Variety. Retrieved 2019-01-24. ^ Margarita Papantoniou. "Why Are Tuesday and 13 Bad Luck?". GreekReporter. Retrieved 28 December 2017. ^ "Tuesday the 13th… the Friday the 13th of the Spanish-speaking world (and vice-versa)". WordPress. Retrieved 28 December 2017.